With all the news circulating regarding the release of UFO documents gathered by the Russian Navy over the last several decades, some rather interesting parallels have begun to emerge. Perhaps most interesting of all is the notion that, according to the records alleged to have been released, UFOs seem to be monitored in a greater concentration beneath the ocean or near bodies of water (like Lake Baikal, right) than anywhere else. Though some might feel like this sort of information could be a bit skewed (coming from the Navy, as opposed to the airforce), considering that the Navy would have better access to monitoring activity both below and above the ocean’s surface, these surprising details may very well be of greater merit than anything we’ve documented from the skies alone. The only problem: after digging around the net to try and locate the actual documents in a PDF or something similar, I have yet to find any such files, nor any conclusive evidence that this information is true and accurate.This isn’t to say that the information we’re recieving is a hoax, of course; merely that the information we’re getting is coming second hand, and largely due to language barriers, etc, we have yet to see the “the horse’s mouth”, so to speak. The debate rages on over at the ABOVE TOP SECRET forums, where several Russian-speaking users are being sought-out in an effort to obtain electronic copies of the supposed Naval files. However, considering the number of UFO files that exist in the public domain pertaining to the USSR (courtesy of the CIA), it isn’t too much of a stretch to assume that the Russian Navy had been gathering files of their very own.Looking at what evidence has been produced thanks to media sources around the globe, one story that gives me chills deals with an underwater training operation in 1982 that took place at Lake Baikal, the largest fresh water lake in the world. Thanks to the translation efforts of FIFIGI, a member of AboveTopSecret.com, better details involving the incident have been posted under the message thread titled *BREAKING* Russia Discloses/Releases UFO Files (You may view FIFIGI’s complete comment by visiting http://www.abovetopsecret.com/forum/thread484767/pg2#pid6780362). Concerning Lake Baika, the following was included:(There is) very impressive data on the observation of a UFO in Baikal lake. (Within) the depths of the lake sailors repeatedly observed luminescence resembling searchlights and flashes similar to electric welding, as well as in the lake radius in the form of unexplained bright luminous silver discs and cylinders.In summer 1982 military divers, during their training, dived in the water of Lake Baikal several times and almost came face-to-face with underwater swimmers in their body-fitting silver jumpsuits. They looked similar to normal people, only about three meters tall. In addition, at a depth of 50 meters, (the beings) had neither an aqualung, or any other devices, but their heads were concealed in spherical helmets. Attempting to catch (the) unidentified divers ended tragically. From seven people trying to do this using a net, four became disabled and three died.Other translations regarding the fate of the four surviving divers read “seriously injured” as opposed to “disabled”. Though the exact details regarding how three of the divers were killed remains a mystery, there is one very synchronistic element to this story which immediately came to mind as I read of the concentration of UFO reports around Lake Baikal.In 1946, Russian science fiction writer Alexander Kazantsev wrote a fiction short story titled “A Visitor From Outer Space” which explained the Tunguska Blast of 1908 as the result of a Martian spacecraft’s nuclear engine exploding. 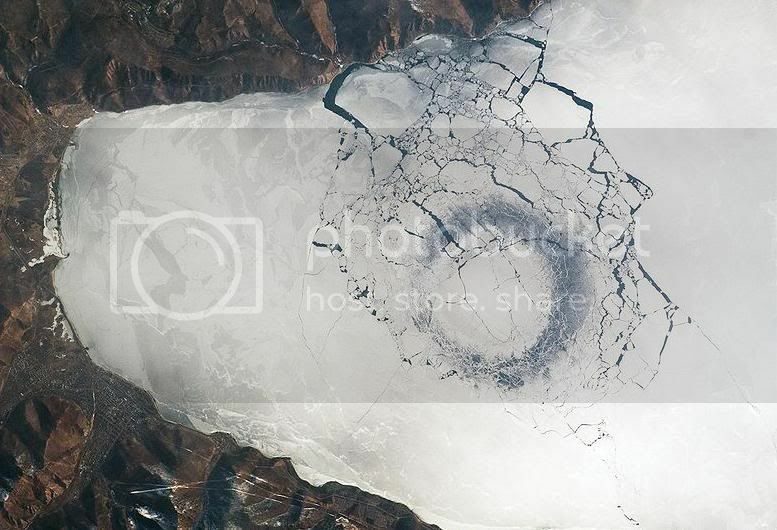 In the story, the craft had been attempting to gather water from Lake Baikal, and earlier this year when large, circular rings of ice appeared in the surface of the lake, I joked that “the spacecraft must have returned”. Perhaps, however, it is instead the case that they hadn’t returned at all; could they instead have been there all along? The notion provides a little food for the imagination, if nothing else.Whatever the circumstances, information regarding the legitimacy of these reports will be sought out, and updates will be provided here as soon as I learn of anyone who gains access to the Russian Naval documents. For now, this will remain a very interesting story regardless.UPDATE: A variety of news sources are now carrying this story, including Fox News. (Also see comment below from Rene Amoureuse, describing an interview with Russian Navy on the Fox News channel). Hm that story sounds like the classic science movie “The Abyss” . I watched an interview with Russian Navy yesterday on fox. He commented the case Lake Baikal, according to his words encountered “a group of humanoid creatures dressed in silvery suits” Three people died during the ensuing chase. Thanks for this info Rene! I’ve been looking for the video since you posted your comment, hoping it might be uploaded to Youtube. However, I haven’t been able to find it yet. Does anyone else know if the interview with Russian Navy Officials has been uploaded anywhere on the web?